Nodding beggarticks is a wetland species that is found across the US and Canada in most states and provinces with only a handful of exceptions (e.g. Florida, Labrador) (USDA 2010). In British Columbia, it is found across the province, though it is more frequent east of the Cascades. This is an annual, fibrous-rooted species that often grows mixed with other species of Bidens. It is found in a variety of habitats including shorelines of lakes and ponds, marshes, ditches, often in standing water, in sandy or mucky sites. It is also reported from mudflats, mucky bottomland, depressions in forests, sedge meadows, fens and bogs, cedar swamps (Michigan Flora Online 2011). Along the BC coast, it may be found in tidal sloughs and marshes. Nodding beggarticks is similar to Vancouver Island beggarticks, but it is readily identified by its nodding flowerheads, yellow ray petals, spherical seed heads, and strap-like leaves. The achenes are distinctive--with convex, cartilaginous summits and very narrow bases. Annual herb from a fibrous root; stems erect, simple or branched, sparsely spreading-hairy to glabrous, 0.1-1.0 m tall. Basal leaves lacking; stem leaves simple, unstalked, opposite, linear-lanceolate to lanceolate, 1.5-20 cm long, 0.5-4.5 cm wide, sometimes joining at the stems, coarsely saw-toothed to nearly entire, glabrous. Heads with ray and disk flowers, sometimes discoid, hemispheric or nearly so, numerous when well-developed, nodding with age; involucres 12-25 mm wide; involucral bracts in 2 dissimilar series, the outer ones 5-8, green, leafy, unequal, spreading or reflexed, linear-lanceolate, usually longer than the disk, the inner ones erect, narrowly egg-shaped, mostly 6-8 mm long, greenish-brown; ray flowers 6-8, or sometimes lacking, yellow, about 1.5 cm long; disk flowers yellow. Achenes mostly 5-8 mm long, tan, narrowly wedge-shaped, compressed-quadrangular, the marginal nerves and convex summit tending to be thickened and light coloured at maturity; pappus of 3-4 retrorsely-barbed awns, 2-3 mm long. 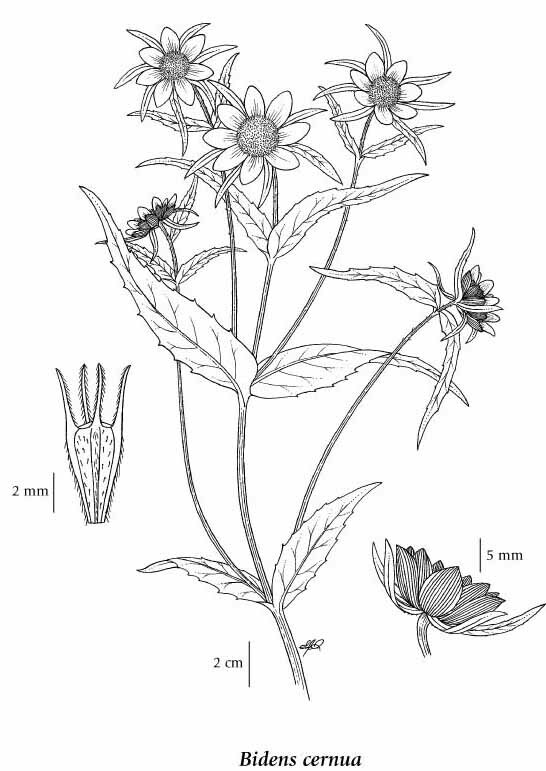 The following three Bidens species are most easily confused. Modifed from Ganders et al. (2002). Wet ditches and lakeshores in the lowland, steppe and montane zones; common throughout BC east of the Coast-Cascade Mountains, less frequent on Vancouver Island and the adjacent mainland; circumboreal, E to PQ and S to NC, AR, OK, TX, NM, AZ and CA, Eurasia. Bidens cernua var. cernua L.
Bidens cernua var. elliptica Wieg. Bidens cernua var. integra Wieg. Bidens cernua var. radiata DC. Ganders, Fred, Rose Klinkenberg and Brian Klinkenberg. 2002. British Columbia loses an endemic species: Bidens amplissima (Asteraceae) also occurs in Washington State. Botanical Electronic News 293.